Phase II: Postcards Are Here!!! 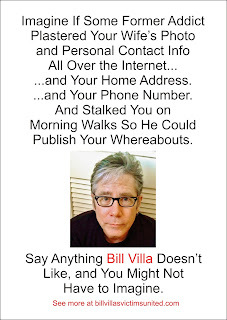 This first set of postcards focuses on Bill Villa's online abuse of women -- that being his most loathsome of his many loathsome abuses against his "Foes List" victims. Simply click the link below any card to deliver it to your computer as an image file suitable for emailing or printing for mailing. The first card is useful in communicating with businesses such as those throughout the Food and Beverage industry, Advertising Agencies, and beyond. One would guess that larger businesses in the Food and Beverage industry might have workplace safety and sexual harassment policies that would bar from their premises anyone such as Bill Villa who had produced and promoted such a violent, hateful, chilling, and misogynistic image and commentary as the one below. If anyone has insights on this matter, please contact us at WorkplaceSafetyConcerns@billvillasvictimsunited.com. The second two postcards are “his-and-her” versions intended for personal acquaintances and peer-level associates of Bill Villa's. 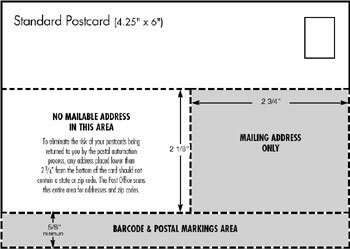 We've found though trial-and-error in developing the postcard marcomms that, if printing for snail-mail delivery, Avery 8386 paper works best. We again thank our advertising agency for producing such excellent marcomms to “build the Bill Villa brand” and to help us rebut and warn against his long campaign of lies, half-truths, innuendo, and references to violence. Together, let’s get the message out there loud and clear and save others from being victimized by Bill Villa's hate blog and "Foes List"! We couldn't be more pleased with our web site. We look forward to comments from the reader community as they have an opportunity to give it a good, deep read. We’re proud that our site was designed by a top-notch advertising agency in the Food and Beverage industry, and what's even better than that is that they did it pro bono! Because of their concern over possible retaliation by Bill Villa on his hate blog, however, they're staying anonymous (for now). They have our very deepest thanks. We also retained a Search Engine Optimization (SEO) consulting firm to ensure that Bill Villa’s Victims United ranks high in Google searches for Bill Villa’s name and other identifying parameters. We want our site to “be there” to provide a sound rebuttal every time a Google search turns-up Bill Villa’s hate blog and its lies, half-truths, and innuendo smearing us. SEO is an ongoing process, but we’re already ranking quite well on Google searches considering we are a brand new site. Google and see! And then do it again next month! To warn Bill Villa’s potential victims and suggest strategies to protect their families, associates, and themselves from being smeared and threatened by Bill Villa. To expose Bill Villa’s abuses to those he would prefer to be unwitting of them so as to hopefully persuade him to put his decade of hate and compulsive spewing of lies, half-truths, innuendo, and violent references behind him and rejoin the community as a well-adjusted, productive citizen. We will then be delighted to remove this information resource site. When Bill Villa removes his lies, half-truths, innuendo, and references to violence against his “Foes List” of nearly 60 teachers, academics, journalists, lawyers, business professionals, civic leaders, civil rights leaders, and clergy members from the web, we will be delighted to remove this information resource site. To those three ends, we have produced the first in a series of “icebreaker” post cards for the community of Bill Villa’s victims and their families, associates, and friends to use when opening a dialog with interested parties to expose Bill Villa’s abuses. The postcards, in turn, link to our web site where victims’ stories of Bill Villa’s abuses can be told in more detail. We do ask that anyone using the postcards stay on topic in their personalized message and reflect the three major points in our mission statement. We will not be a party to libeling Bill Villa in any way, rather simply a source of information on his longstanding abuses and a repository of information on how to avoid avoid those abuses.